Hundreds of sales leaders kicked off 2015 at SalesLoft’s Rainmaker, an event marketed as the “first ever” sales development conference. A Forbes piece named sales development “the biggest trend in sales today” two weeks later. Then in February, Google search interest for “sales development representative” hit an all-time high. 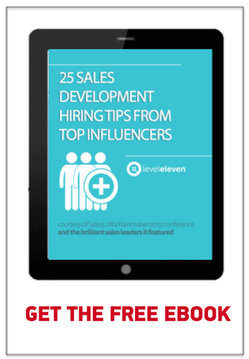 It’s pretty simple: If you’re one of the cool kids, you’re talking about sales development. If you’re a sales leader at a high-growth company, especially in tech, you’re probably hiring for it. And why wouldn’t you be? Research shows that dividing your team into those who prep leads and those who close them works. InsideSales and the Kellogg School of Management conducted one study that revealed how having a business development team can raise the close ratio 7 points — meaning your 10% close rate becomes 17%. Plus, having a sales development role means you have more resources to strengthen what’s happening at the top of the funnel. We’ve all seen the stats around faster lead response times boosting conversion rates. Dedicating a team to sales development lends itself to that sort of optimization, along with other conversion improvements. Regardless of which approach you take, challenges come with building a sales development team. We’re talking about a role with an average tenure of 14.2 months, as Craig shared at Rainmaker. That means you better onboard quickly. We’re also talking about a role that many companies treat as a platform to prep team members for becoming closers, rather than as its own destination. Between that and the amount of objection SDRs face, keeping these team members motivated takes work. Sales development leaders need to hire the right personalities and put together a strong sales performance management plan that includes plenty of recognition. Many credit Aaron Ross’ Predictable Revenue for putting popularity behind sales development in 2011. Although it found its trendiness then, the premise of sales development has been around since at least the ‘80s, according to SalesLoft. Sure, the technology around it has changed. It will continue to. But the point is: There’s more knowledge out there around what works in sales development than you may expect. If you aren’t already, tap into that knowledge. Use it as guidance in testing what kind of sales development structure works best for your organization. Eventually you’ll find your way to the likes of that 7-point higher close rate and greater efficiencies in the sales process leading up to it. Building a sales development team can impact your business dramatically, but it presents a set of unique challenges.